If you don't want to wear white or ivory on your wedding day, pink wedding dresses are a great alternative, especially if you choose a pale pastel shade of pink which can look just as virginal. Pink shades of flowers are also available in a multitude of colors and styles, so the entire wedding can be pink if you want it to be too! Of course, getting married in a colored wedding dress is another way to cut costs as you can even get a dress made for you on the pretence that it is for an evening dinner or other special occasion. Remember when negotiating on price, omitting the "W" word, will usually get you a far cheaper price. All you to have to do is ask! Why are Colored Wedding Dresses becoming more popular? First of all, many brides are having their second or third wedding and white is simply not appropriate anymore; after all, how many of them are still virgins? Pale skinned brides can look washed out in white or ivory, so pink is an ideal choice to give color to a pale complexion. And light shades of pink can look equally pure and virginal. Modern weddings no longer conform to tradition. When the bride and groom are often paying for the wedding themselves, convention is thrown out of the window so why not deviate from tradition on the wedding dress too? While pink is a popular color, so is blue, purple and even black. For many brides wanting a gothic feel to the wedding, choosing a black wedding dress is the only choice. Not that you have "go goth" to wear black - even Sarah Jessica Parker admitted to wearing a black wedding dress! So you've decided to be different and dress en rose. So why not go a little wild with a totally pink wedding theme? Men look great in pink too - dress them in snazzy pink shirts and/or ties. Head to your local department store and see what's available in your chosen shade. You may get lucky when looking for accessories, as pink bargains are often available in non "safe" colors like blue or grey. For a more subtle approach, dress the groom in a light linen suit and tuck a pale pink silk handkerchief in the top pocket. And remember to check out online stores for pink accessories - there is an AMAZING range out there. 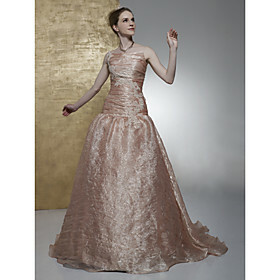 Tip: Be sure to tell your guests or at least your closest friends that you are wearing a pink wedding dress. Otherwise some of them may turn up in a pink dress too! I love this stylish taffeta dress with a cute mermaid neckline and long cathedral train. It's also available in ivory, champagne (another great alternative to white!) and, of course, white. There are lots more colored wedding dresses available from our wholesale supplier that offers a tailor-made dress service. Just take a peek, whether you want a white dress with colored detailing such as a bow or embroidery, or whether you want to make a statement with a totally non-white look.